Here's a quick technical description of how the Pseudo Random module works: It's basically just a conventional linear feedback shift register (LFSR) that generates a pseudorandom bit sequence (PRBS) which does not repeat for a very long time. The CD4015 shift registers are connected serially, forming a 24 bit shift register. Some of the bits are tapped off into XOR gates, one of which is switched back into the shift register as feedback. This creates four selectable PRBS patterns. This module will soon be available in our store. 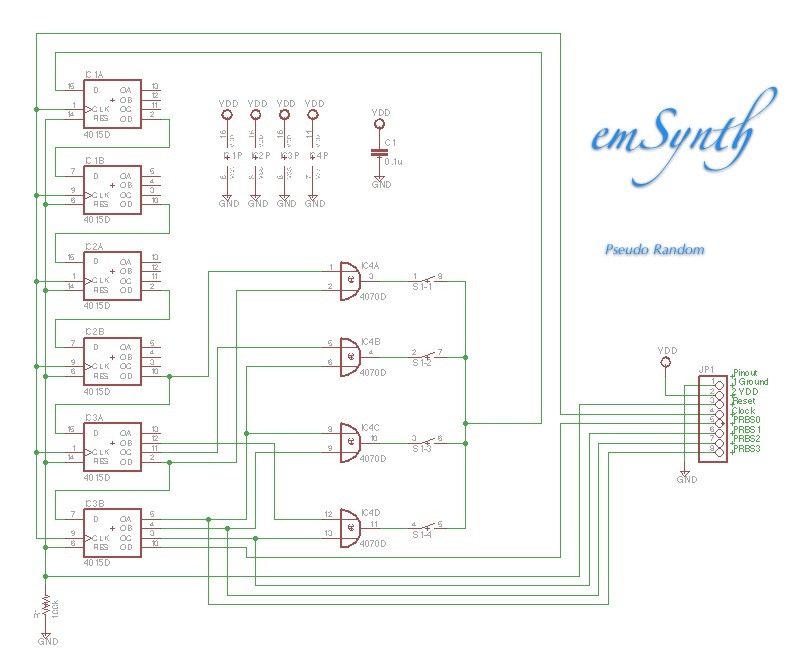 Using the Psudo Random module is very simple. Begin by selecting one of the four DIP switches and moving that switch to the ON position. All three remaining switches must be in the OFF position to prevent logic errors and a corrupted PRBS. Then hook up VDD and Ground, apply a Clock signal, and connect PRBS0 to your next circuit (that's the output). The board also provides the remaining three digits of the last shift register output, so you can set it up to grab a 4-bit word at a time if you like (every 4 clocks). Also the reset input is provided with an on-board pulldown resistor in case you wish to reset the PRBS.